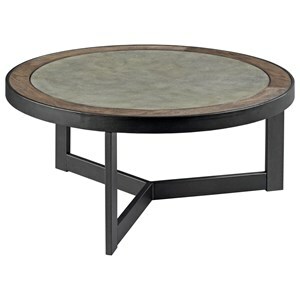 This round end table's balanced design brings a touch of contemporary appeal to this industrial piece. The sleek, metal base and burnished wood top come together to create a one-of-a-kind look for this industrially styled table. 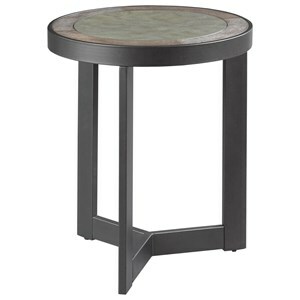 The Graystone Industrial Round Chairside Table with Metal Base by Hammary at Hudson's Furniture in the Tampa, St Petersburg, Orlando, Ormond Beach & Sarasota Florida area. Product availability may vary. Contact us for the most current availability on this product. This collection of occasional tables features mixed material construction and a geometric design, perfect for curating an industrial look in your home. Details such as the concrete inserts next to dark, burnished wood bring out an eclectic flair in these pieces. All this creates a balanced collection that is sure to make your living room a stylish place to entertain. 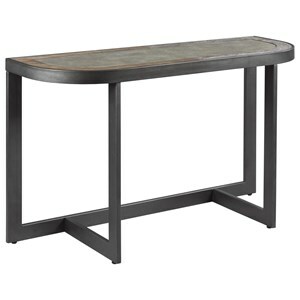 The Graystone collection is a great option if you are looking for Industrial Contemporary furniture in the Tampa, St Petersburg, Orlando, Ormond Beach & Sarasota Florida area. Browse other items in the Graystone collection from Hudson's Furniture in the Tampa, St Petersburg, Orlando, Ormond Beach & Sarasota Florida area.